This is the final post from my trip to Spain earlier in the year. It's taken me a while to get round to this one, but it was a great night bar hoping in Madrid. After the epic food tour I went on in Istanbul last year, I was keen to take another food tour while in Spain. I found the tour in Turkey, not only a great way to try some of the city's best food, but also an excellent way to get orientated and pick up lots of tips about the local customs and culture. 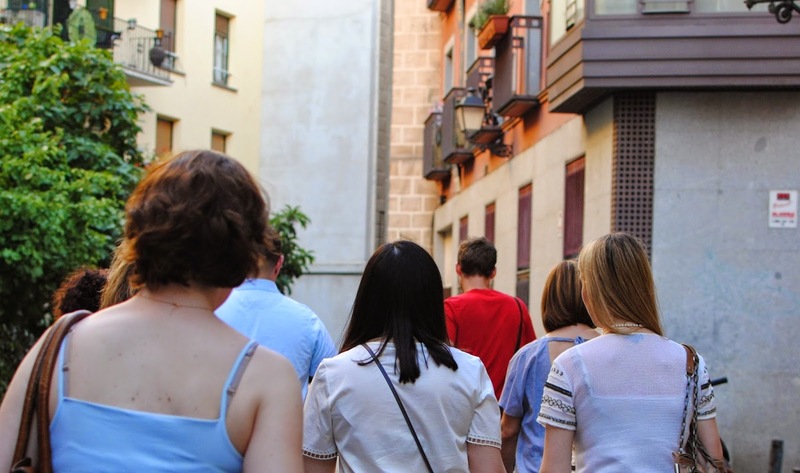 We booked on the Madrid Food Tour: Tapas, Taverns & History Tour and after a long day visiting the Reina Sofia we headed to the meeting at the specified meeting Opera. Having jokingly been building it up the chances of getting Kiwi James as our guide (after some YouTube stalking and spotting him the night before), it frankly would have been a disappointment if we'd got anyone else. James duly arrived and after introductions, and Becks disclosing she was also a Kiwi, we were underway. The rest of our group was made of a lovely American couple who were on their honeymoon and a group of American women who worked for Pepsi and were in town for a conference. The four women from Pepsi were fussy eaters and drinkers. Why do you go on a food tour if you aren't open minded and want to try everything? Most odd. Being in the tourist heart of the city was expecting a walk to our first location, assuming that anywhere close by wouldn't be authentic. 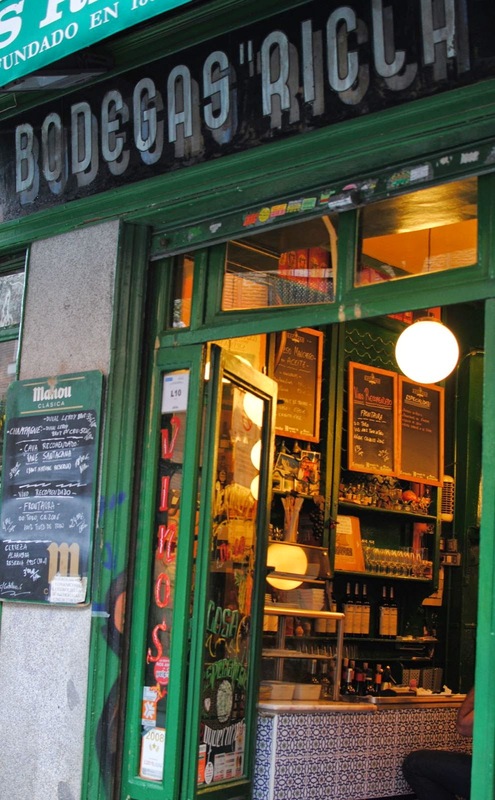 However, we headed into the closest bar to our meeting point the Taberna Real. James ordered us glasses of sweet red vermouth and a plate of jamón ibérico de bellota. A number of complimentary tapas hit the bar including olives, roasted almonds and the ubiquitous patatas fritas. As we drank and ate James explained some of the customs of eating tapas in Madrid and when it is perfectly acceptable to throw your olive pips on the floor (as it was in Taberna Real). I enjoyed the vermouth a lot more than I was expecting to. It was the first time that we'd eaten the highest grade of jamón on our trip and it was fantastic. When we left Taberna we headed to Plaza de Oriente in front of the Royal Place where James told us a little about the history of Madrid. 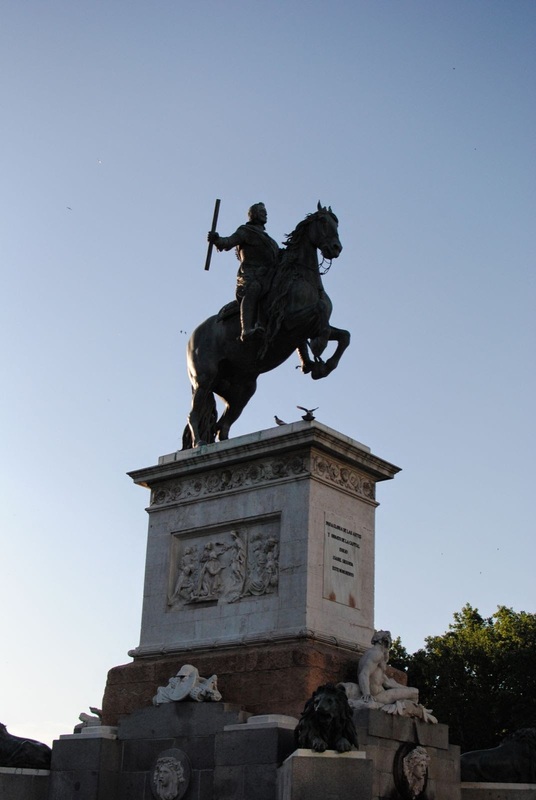 He also pointed out the statue of Felipe IV which was the first statue ever made where the horse is raised on its hind legs. Apparently Galileo was consulted on the maths. We wound our way through the Hapsburg district, to Plaza Villa which contains a statue of Don Alvaro de Bazán one of the architects of the Spanish Armada. We headed past two more small squares before arriving at the second stop of our evening Bodegas Ricla, a small family run bar. Inside the bar James ordered a bottle of white wine for us and sardines, cabresse cheese whipped with cider and meatballs arrived on the bar for us to taste. The meatballs are cooked by the owners mother (if I remember correctly) and were my favouite and mopped up with the bread which came served with them. Leaving the bar we headed into Plaza Mayor where rehearsals for a show the next night were taking place. Inexplicably the grand Plaza wasn't called out as one of the highlights of Madrid in my guide book, so I was pleased that we passed through on the food tour. I was beginning to feel that I was getting my bearings in central madrid. The final three stops of the night were very close to where we were staying and perfect for stumbling back to apartment afterwards. Casa del Abuelo was our first stop. They have two branches close together and we went for the less crowded bar on Calle Núñez de Arce. We tried the sweet and plump prawns cooked in garlic oil with a hint of chilli and parsley and washed down with a glass of the house sweet tempranillo wine. Our penultimate stop was a sherry bar called La Valnecia. Known as a bar where the resistance met during the Franco era, one of the house rules is no photographs. Probably less necessary now that Spain is a democracy, but the rule still remains. Sherry comes from barrel and we had two carafes to share amongst our table; a white sherry followed by a red. Just like the vermouth at the start of the night, if you'd asked me, I would have said I didn't like sherry. However, they were both enjoyable, with the white being my preference. I remember a tapa of hard cheese that went down well too. After bar hoping and snacking we head to our final venue of the night to fill any remaining space that was left in our bellies. El Lacon that Becks and I had visited on our first night was to be our final stop. We kicked the evening off with a bottle of Spanish red wine (above) that was fantastic. Even though we had it late in the evening and I'd consumed a fair bit before then, trust me on this one and seek out a bottle for yourself next time you are in Spain. They sell it in El Corte Inglés. Knowing that we'd already visited previously, James made sure he ordered different dishes with grilled asparagus, fried shark with cumin and lemon and tender grilled pork some of the dishes arriving at our table. Overall the food tour was a great experience. It was a good way to get orientated in Madrid (even though we'd been there for a couple of days already), understand more about the culture and importantly the customs in the local bars. It was a different beast the to Instanbul Food Tour that I had previously been on, I left this one in less of a food coma but more tipsy, but they are both experiences I'd happily repeat. All of the places we visited during the food tour have been added to my European map. I happy to read that you have great experience in Madrid. If I talk about my tour in Spain, I enjoyed in Barcelona more as compared to Madrid. Thanks! When in Madrid, definitely take the time for a tapas tour. 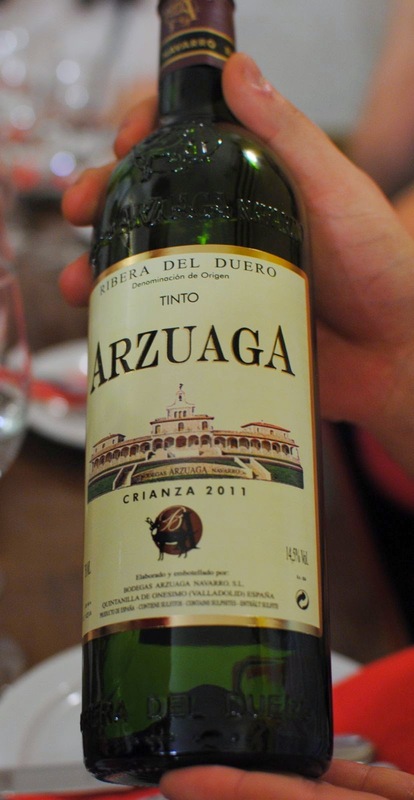 The quality food with the amazing wines Spain has to offer will leave you breatheless. You can do from a basic mercado tapas afternoon to a luxurous gourmet restaurant, in both cases you won't regret it!